Majili is a Hit as the film has held well on weekdays with rock steady collections. The film has collected a distributor share of 25.50 Cores worldwide in it’s first week. 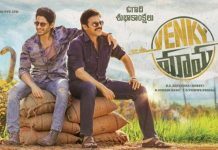 This is the biggest opening week ever for Naga Chaitanya beating Rarandoi Veduka Chudham which had collected 17.30 Cr share. The hold varies from areas to area with the best being UA followed by Nizam. The film is setup in Vizag and also performing like a Blockbuster here as it has high chances to collect 5 Cr share (Total UA area) in full run. It is also performing very well in Nizam and has high chances of collecting 13 Cr share in full run. The film is doing decent business in Overseas with a gross of 700 thousand dollars in USA. It will do more than 800 thousand dollars in full run.